Pumpkin is an orphaned raccoon who found love and friendship with her two canine sisters, Toffee and Oreo. She lives in the Bahamas with her human parents and pooch sisters. 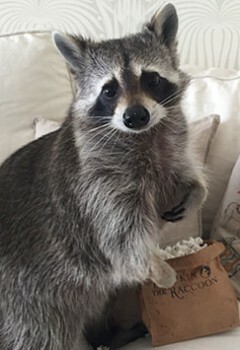 She can be found on Instagram, Facebook, and Twitter and is a soon to be “co-author” of Pumpkin: The Raccoon Who Thought She Was A Dog, a picture book being released by St. Martin’s Press.